​Through the Contemplative Academy I offer mentoring, teaching, research, lectures and workshops in Contemplative Education, and design for the application of institution-wide contemplative orientations. I combine experience from my long standing contemplative practice with knowledge gained from the three stages of my career as a working artist, community developer and contract researcher, and academic. Across the course of these three stages I have developed substantial interpersonal and communication skills working with a diverse range of people in varied teams and settings. I bring these experiences plus a commitment to empathetic and open communication and the development of holistic approaches that recognize the place of subjective, embodied, affective, intersubjective and transcendent ways of knowing in education and all human endeavors. What follows is a brief overview of my teaching and research experience gained over the past 32 years. ​I have taught in diverse settings including government work schemes with students wanting to enter the workforce, on a variety of workshops including those with adults interested in contemplative studies, with primary school students in a creative arts program, design students in Creative Process at Massey University’s Design School, in drug and alcohol rehabilitation centers, with marginalized groups at risk of HIV in Papua New Guinea (PNG) and most recently in the tertiary sector in Australia. I have conducted research, lectured and taught in the tertiary sector on the Core Curriculum in the School of Theology and Philosophy, ACU; Social Science and Policy Case Studies in Practice in the School of Social Science and International Studies (SSIS), UNSW; lectured on The Resilient Law Student: Theory and Practice, Contemplative Approaches, UNSW School of Law, UNSW; facilitated and presented workshops on Mindful Leadership for Student Life and Learning, UNSW taught in the University Orientation and Study Skills (UOSS) program at the Learning Centre, UNSW; Social Science and Policy, SSIS, UNSW, Sydney; Learning and Transformation, School of Education, University of Western Sydney (UWS); Peer Writing, The Learning Center, UNSW; taught and lectured in Society Environmental Policy and Sustainability, Philosophy of Science, School of Humanities, UNSW. From 1999 – 2007 I developed, facilitated and managed educational community arts and sexual health programs teaching individuals recovering from drug and alcohol dependency, mental and physical ill health, and those marginalized by poverty, gender and HIV status. ​From 1983 – 1990 I taught art and design across a range of formal and informal settings including Massey University’s School of Design, Wellington, Labor Department work schemes and art classes for children and young adults. ​I have conducted contract and academic research working for a number of organizations ranging from the Mental Health Foundation of New Zealand, where I examined the potential of creative arts as a medium for mental health promotion (http://www.mentalhealth.org.nz/get-help/resources/search/?topic=20&topic_only= 1) - to research on Mindful Leadership for the Office of Student Life and Learning, UNSW. Currently I research in the area of work/life balance and the ways this is impacted by Information Communication Technology (ICT). I also continue research and writing in contemplative education and studies, and my publications range across the history of contemporary contemplative education, the ground-of-being experience in contemplative education, contemplative law, contemplative methodologies, second-person or intersubjective experience in education, and most recently contemplative practice in mathematics education. In 2015 I was awarded a contemplative fellowship at the Mind and Life Institute, Massachusetts, USA, where I researched contemplative methodologies. Conducted qualitative and mixed methods research and developed new approaches to multi-level coding. Performed textual research in comparative religion, contemplative, transformative and integral education, contemplative studies and sciences, neuroscience, psychology and meditation research, practice learning, social practice, phenomenology, embodied learning and cognition, consciousness studies, classical yoga philosophy and interdisciplines surrounding these areas including mindful leadership and contemplative ethics. Developed literature reviews and contributed to research design and methodology. Attended and contributed to design meetings with co-researchers plus research management across a range of research projects, including time management, development of methods and allocation of project roles and data analysis. Conducted and analyzed semi structured and in-depth open ended interviews. Strong analytical skills and development of new approaches in phenomenological and contemplative methods congruent with spiritual and contemplative practice. Employed effective communication skills and demonstrated the ability to work independently and in teams interpreting clients’ needs across a variety of contexts and disciplines. I am available to conduct workshops and present lectures that highlight the benefits of contemplation through practice and theory, to address the increasing stress and anxiety we are suffering. These presentations can also support creative and empathetic response, heighten self-awareness, and increase prosociality and emotional intelligence. 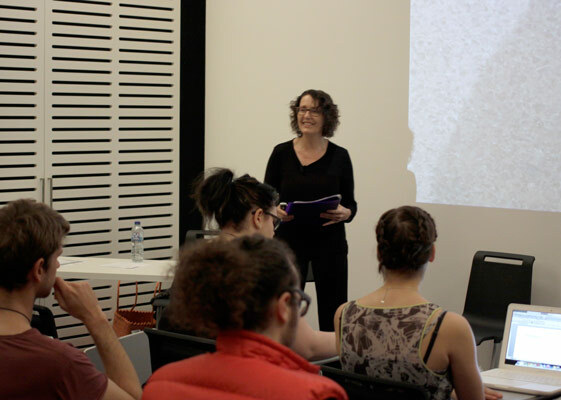 To date I have lectured on contemplative law, ethics, education, acting and art in tertiary settings and conducted workshops on contemplative writing and art, self-care and care of others, and a symposium on Contemplative Education at UNSW in 2014. Recent presentations include: co-presentation on ‘translating the ineffable,’ or prefigurative experience from contemplation at Meeting of Minds: Art, Science, Technology and the Brain, Marina Abramović: In Residence Program, Sydney; co-presented on appropriate methods to engage the precognitive through contemplation at the Centre for Agency, Values and Ethics (CAVE), Macquarie University, Sydney, and lectured on contemplative art at UNSW’s School of Art and Design. 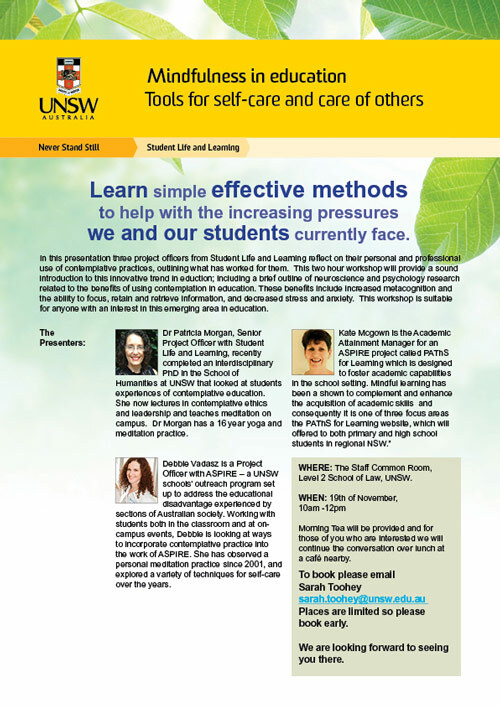 The Mindfulness in education: Tools for self-care and care of others workshop, UNSW, November 2014 and the Standing still to learn, Contemplative and creative approaches to education: New paradigms in teaching and learning symposium, UNSW, May 2014. I have taught on a range of courses receiving good feedback - Course and Teaching Evaluation and Improvement (CATEI) responses for a Social Policy course 2012-13, UNSW were positive, with the majority of answers to all 9 questions in the top three categories ‘strongly agree’, ‘agree’, ‘moderately agree’. For example there was a 100% positive response to the question ‘This facilitator/tutor helped me to improve my ability to learn independently in the future’. “She tried really hard to make the boring content fun, making us have debates and do activities that we found interesting. It helped to break up the intensity of the course and make it more interactive.” “Getting us into groups so it was easier to make friends, giving helpful feedback on assignments, she helped with assignments a lot, lots of group activities and a fun final tutorial, lots of helpful handouts” (First and Second year students, Social Policy, UNSW, 2012 – 2013).